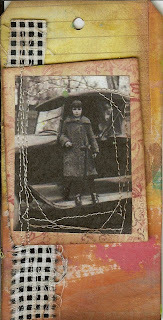 nancye's art and beautiful junk: What a nice week end! Here are some of Healing Tags I've been working on this last week end. I will be putting words of healing on the backs but I have not gotten to that point yet. I must make 25 in all and then send them to France to be made into a book. This is first swap I have been in so I hope I'm doing this right. If they are not healing to anyone else...they certainly have been healing to me. I have been trying to make a decision about my family lately. I think in all this art I have finally come to a conclusion. It is starting to feel right. I'll let you know how this goes after I tell the family members. All in all I feel at peace with everything. 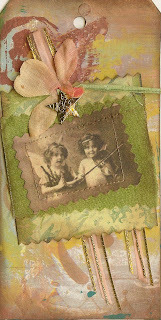 Your blog is lovely, the healing cards are wonderful and I thoroughly enjoyed viewing your dolls....they are really sweet!! These are gorgeous, as is everything on your blog! Those tags will have a great curative impact I feel certain! Your tags are awesome!!! Can't wait to get one in my book!